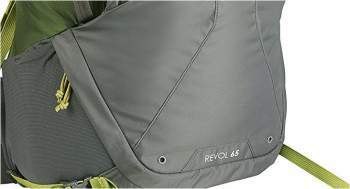 Kelty Revol 65 pack with its shove-it pouch. This Kelty Revol 65 backpack review is about the largest pack from a completely new Kelty’s series launched in 2017. The Revol 65 is a load-hauling tool with a rather streamlined design, suitable for backpackers and travelers. It offers 3950 cubic inches (65 liters) of volume and it weighs only 4 lb 3 oz (1.9 kg). This is a pack for men, and yet another smaller men’s pack from the same series is the Revol 50. But you should know that they also have a parallel series for women with the same basic features, in sizes 60 liters and 45 liters under the name Reva. Modern design and a unique bottom compartment opening. 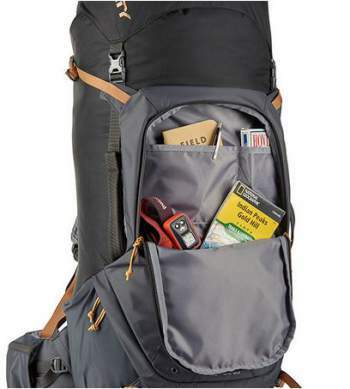 I already mentioned the streamlined design, so you do not have too many details on this pack, in particular side zippered pockets, which are present in so many Kelty’s packs, are missing here. 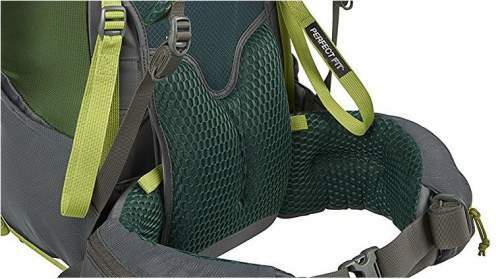 As you realize from the pictures, this is a classic top-loading pack with a lid and a collar with a cinch cord underneath it. This is the only access to the main compartment. But the pack also has a zippered access to a lower sleeping bag compartment, where you have a peculiar detail. The zipper is a U-shaped structure and not inverted one, as we are used to have in practically all packs. See the picture below. The unique bottom compartment entrance. One nice feature is the lined exterior pocket for a water bladder. This is convenient to take the bladder out and put it back, and it saves the space in the main compartment. Another nice feature are dual grab handles, one on each side. 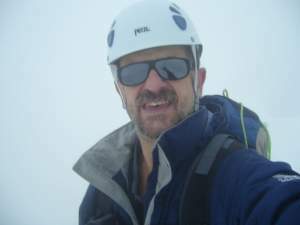 On the bottom front section, you have dual trekking pole loops. There are also 4 attachment loops on the bottom, such small details are always good to have, they do not add extra weight but they may be very useful for equipment attachment. The pocket organization is standard. The usual dual stretch water bottle pockets are on each side of the pack, and dual zippered pockets are on the hip belt. You cannot miss noticing the large front zippered pocket with internal organization and a shove-it pocket behind it. This is a very useful storage area for extra layers or even a helmet. There is also a small zippered lid pocket. 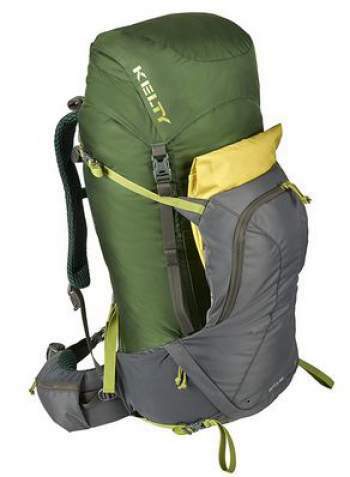 Kelty Revol 65 backpack offers an adjustable torso length through Kelty’s well-known PerfectFIT system. This system provides the most accurate on-body adjustment in the range from 15.5 to 21 inches. This works with the pack on your back, no need to take it off for adjustment. 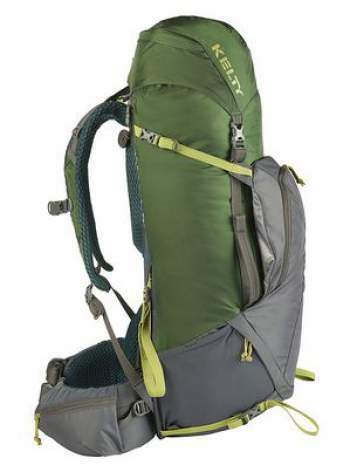 So here again Kelty has something unique, used also in a few other recent models, like Kelty Catalyst 65, Kelty Coyote 70 pack for women, and Kelty Reva 60 for women. 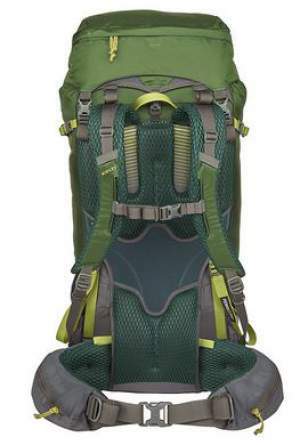 This allows for a really customized fit because all is done with its full weight and with the pack on your back. The fitting is simple; all you have to do is to pull the two yellow straps shown in the picture below. The straps for torso adjustment, and a generous lumbar padding. Also visible are pull loops for lumbar padding adjustment. The suspension is based on a lightweight aluminum perimeter frame and an HDPE frame sheet which work in tandem providing stability and load-hauling support. They have introduced also a parallel pivot design in the Kinesis hip belt which adds to stability and responsiveness by following your body movements. As you realize from the images, there is a very pleasant hex mesh all over the padded back panel and the waist belt, so you have an excellent cushioning and ventilation. The usual load lifter straps are there to relieve stress on your shoulders. An adjustable sternum strap helps in positioning the shoulder straps across the chest to prevent chafing under the arms and on the shoulders. The suspension system with adjustable torso length. A few words about this new system available only in Kelty’s Revol and Reva series. Contrary to various pivoting (or moving in general) hip belt system available in some advanced packs, in this case, you have a sort of a parallel moving system. Although there are several different designs of pivoting systems in other brands, I do not remember seeing anything similar in other packs. So as you see, Kelty does not stop surprising us with innovations and unique features in their packs. The pack also offers adjustment for the lumbar padding. So you can find the best position for your body shape, and you can do this with the pack on your back. Dual upper straps are available on both sides, see the images. In my view, they are too high on the sides, so only very long objects stored in the side mesh pockets can be fixed with these straps. You do not have the usual straps over the side mesh pockets, and I wonder why they are missing. Another pair of straps is also positioned in an awkward place, neither on the bottom nor on the sides, see the picture above, and they are too far from each other. I am a bit puzzled with this design. Not best compression straps design. The missing rain cover can be ordered separately here, for some $25 or so. The front pocket with internal organization. Weight: 4 lb 3 oz (1.9 kg). Volume: 3950 cub in (65 L). Dimensions: 30 x 12 x 10 in (76 x 30 x 25 cm). Carry weight: up to 50 lb (23 kg). Torso fit range: 15.5 – 21 in (39 – 53 cm). – Body fabric: Robic Nylon 210D Dobby Ripstop. – Reinforcement fabric: Poly 420D Small Back Stafford. Side and lower compression straps. Trap door sleeping bag compartment. Dual side stretch water bottle pockets. Colors: 2 color combinations, see the pictures. At the moment of writing this text, the prices for the packs in the table are $230, 260, 220, respectively. So to conclude this Kelty Revol 65 backpack review, this is a decent and reliable pack, not so full of features as some other packs from this brand, but it will do the job. I stress again that the kinesis hip belt available here is unique. But if you feel this is not for you, check their Catalyst 65 pack, or a bigger tool like Coyote 80. Note also that in 2017, Kelty has launched yet another pack in the Coyote series, the 65 pack for men. As mentioned above, they have a smaller 50 liters version from the same series, so have a look here. If you need something similar for women, then this is Kelty Reva 60, with all the same features but with a women-specific design. Thank you for reading. I hope the text has been useful to you, and if this is so please share it with others. If you have questions and comments, please use the comment box below.